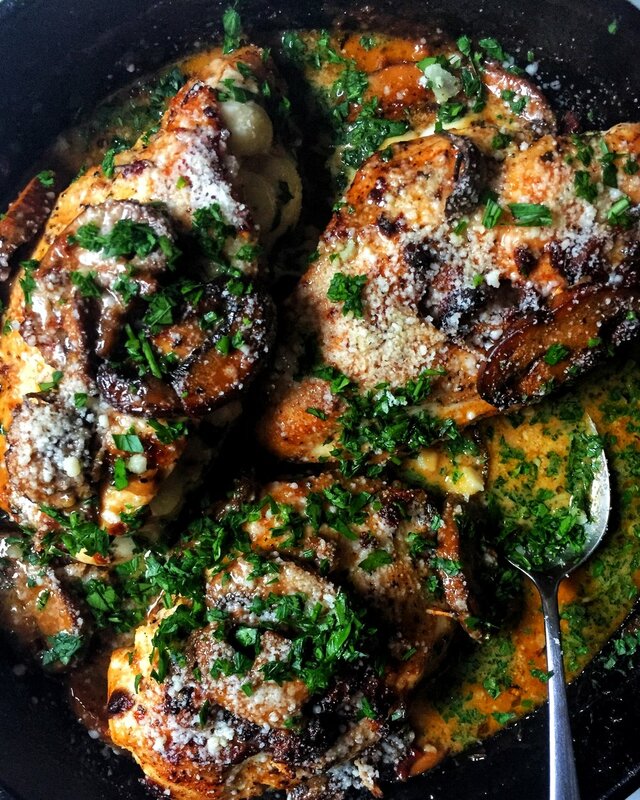 This cheesy stuffed chicken marsala is straight-on cold weather comfort food. I’ll make it for dinner on a weeknight, and serve it with some garlicky mashed potatoes and thyme roasted carrots. It’s even delicious on top of polenta or fettuccine. It’s worth every bit of indulgence. Set a rack in the middle of the oven, and preheat to 400 degrees Fahrenheit. Using a sharp knife, butterfly each chicken breast: starting at the thicker end of the breast, cut a slit horizontally ending right before the thinner end – be careful not to cut the chicken breast all the way through to the other side. In a bowl, combine the parsley, mozzarella, gouda, and parmesan cheese. Add a pinch of kosher salt and freshly ground black pepper to the cheeses, and mix to combine. Stuff each chicken breast pocket with a quarter of the cheese and herb mixture. Pinch together the thicker sides of the chicken breasts, and secure with toothpicks. Drizzle the tops of the chicken breasts with olive oil, and sprinkle a pinch more kosher salt and black pepper on top. Heat 2 tablespoons of olive oil in a large cast iron skillet. Brown the chicken breasts over medium-high heat (about 3-5 minutes on each side). Remove the browned chicken pieces onto a plate, and set aside. Don’t clean the pan. In the same pan, heat 2 tablespoons of olive oil. Add the mushrooms, garlic, sun-dried tomatoes, Italian seasoning, and red pepper flakes. Sauté on medium-high heat until the mushrooms begin to caramelize (about 3-5 minutes). Add the marsala wine, and bring to a boil. Add the heavy cream. Continue to cook over medium-high heat until the sauce is almost reduced in half. Stir in kosher salt and black pepper, and adjust to taste. Turn heat off. Remove the toothpicks from the chicken breasts, and gently return the chicken breasts to the pan. 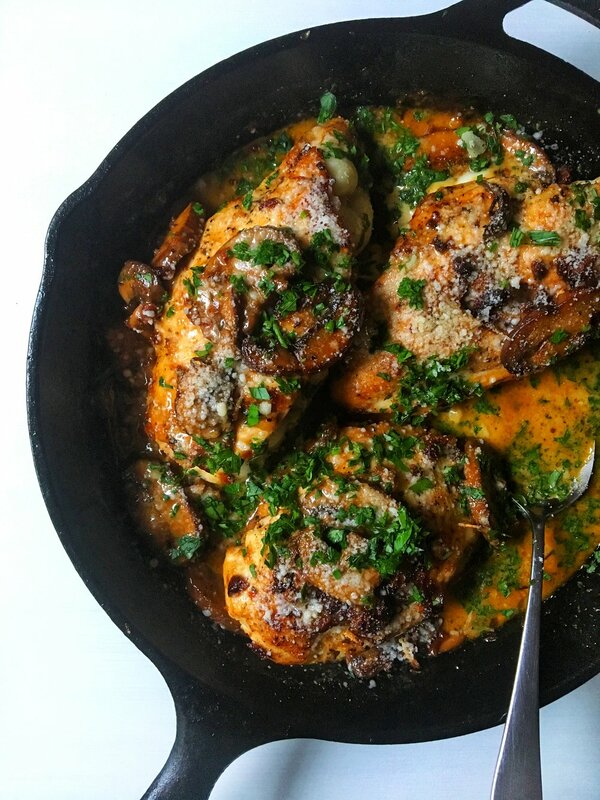 Spoon the sauce and mushrooms over each chicken breast until fully coated. Transfer the pan to the oven, and bake for about 20-25 minutes, until the chicken is cooked through and the sauce is bubbling around the chicken. 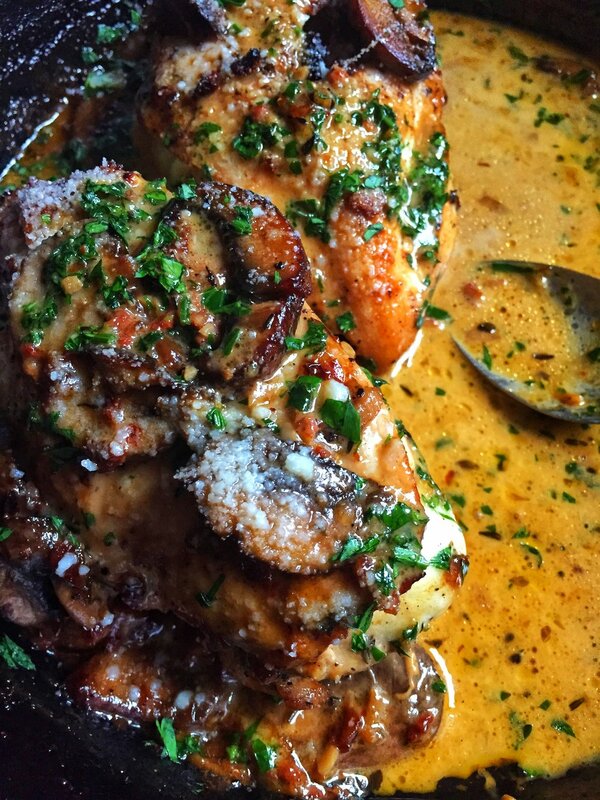 Remove the pan from the oven, and spoon more sauce and mushrooms over the chicken pieces. Garnish with chopped parsley and parmesan cheese. Serve warm with garlic mashed potatoes. Are you ready to start cooking? Weeknight dinner couldn’t get anymore scrumptious.